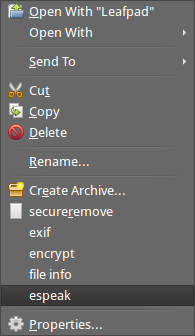 I generally prefer XFCE desktop environment of Xubuntu, but I found its files right-click context menu too humble (no option to compress/decompress files for example, and I'd like some my very special actions there too). The best way to do this is to use the excellent Thunar custom actions feature (now installed as default with Thunar), and as there are no detailed tutorials here I thought it was worth adding one. When a custom action is created it is added to the context menu, as I will show in my discussion below. However, you can tailor when it appears in the context menu and, for example, make sure that your custom action only appears when image files are right-clicked on. You can either create a new custom action (see the discussion below) or edit an existing one. There are many useful examples at the Xfce site and at the Ubuntu wiki, so there is no need to go through them all here, but we will just discuss a few examples to display the usefulness of this feature in Thunar. 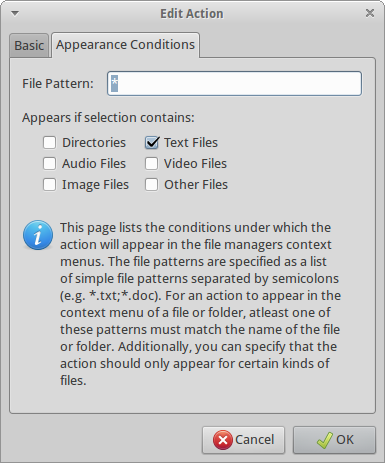 and then make sure that the correct file types were selected in the Appearance Conditions menu (as I have done for a different example in screenshot 3). The command above uses srm (which is in the package called secure-delete), and one should be very careful in using it on files. 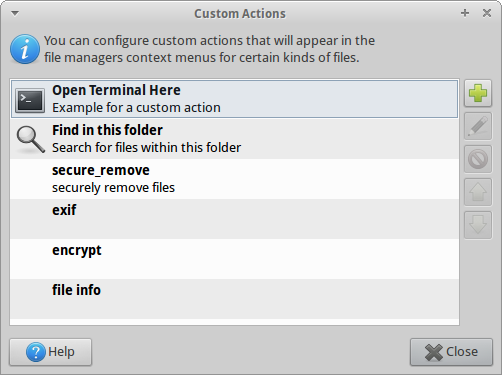 Hence, the GNOME dialog program, Zenity, is often used if confirmation is needed for the actions (like it was used here) so that files are not removed accidentally. Espeak needs to be installed if it isn't already (with sudo apt-get install espeak); the -s option I have used just slows down the speed of the speech a bit; you can specify other parameters as well like different voices, but the -f switch must always go before %f as it shows espeak the text input file to use. 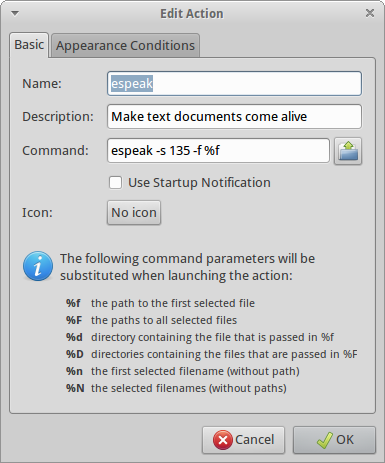 Now, only when you right click a text file, will the espeak option come up, as in the screenshot below. There is so much more that can be done with custom actions, but this was just an introduction to the basic ways of creating your own context menu item. There is a lot more information at the Xfce wiki and a lot of useful examples, and there are also some excellent examples of custom actions in this forum. only to txt: under 'Appearance conditions' tab, check 'Text files', and then add *.txt for 'File pattern'. only for png: check 'Image files', and *.png for 'File pattern'. only for flv: 'Video files', and *.flv. for other files, like pdf: check 'Other files', and add *.pdf. etc. Thunar plugins cover a limited area of options. The main way to add new context menu options is (as Mik said) done by going to 'Edit/Configure custom actions' - and clicking "+" to add. To add wine apps is more tricky. See this answer for Foobar2000 player comming also from Mik. Although the script might not work for all apps, I have tried it on 7-zip archiver too and it works. Not the answer you're looking for? Browse other questions tagged menu xubuntu xfce thunar or ask your own question. How to extract audio from Webm without transcoding? How to show context menu when right-click released? How to get rid of right-click menu scrolling in Firefox under XUbuntu? How can I add items to Xfce root menu?